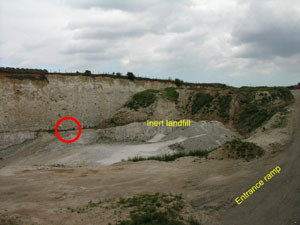 Bramling Quarry is an abandoned chalk pit southeast of Canterbury that contains the only remaining inland exposure of some of the youngest Upper Chalk in Kent. The lower part of pit contains chalk referred to the upper part of the zone of Micraster coranguinum. This broadly repeats the zonal sequence in the rest of east Kent but the thickness is much expanded here and the minor break in sedimentation (hardground) known as Barrois' Sponge Bed is absent. As is characteristic of the zone, flints decrease in abundance upwards. Weathering of the flint reveals beautifully preserved trace fossils (burrows). The upper part of the quarry, accessed from an old incline and terrace, exposes the very soft white chalk of the overlying zone of Uintacrinus socialis. Here the whole thickness is displayed together with the numerous small fossils that are characteristic of the zone. 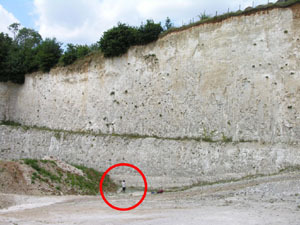 The red circles show Professor Andy Gale to give scale to the photographs of the quarry. 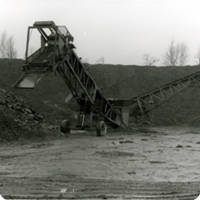 Bramling Quarry was surveyed for designation as a RIGS in August 2005. Permission to visit this site must be obtained from R H Ovenden Ltd. The site is currently being used for landfill.